iPhones are arguably the most used phone on the planet. There are billions of new iPhone setup daily. Much has been achieved for a mobile adventure that started just over a decade in 2007. The sophistication of an iPhone can be hardly matched by any other. Much considered as the most secure mobile phone however, much of the work is done during iPhone set up. iPhone setup is the first thing you must do. 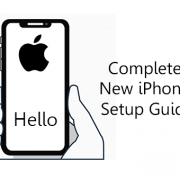 Apple has changed a bit over the years but no worries with this guide. Begin by turning on the iPhone by long press the power button on the top right corner, or on the right edge depending on the iPhone model. Proceed to Swipe to begin New iPhone activation. Provide information as required starting with the location, language, and home country. Then tap Next to continue. Next, you need to connect to a Wi-Fi network. Although this isn’t necessary you can set up a connection with your home or office Wifi when setting up. You can skip by scrolling then choose the option to use iTunes and plug your iPhone to a computer with iTunes installed. The new iPhone will display the phone number installed in it. Secondly, enter the billing zip code for your phone company account, the last four digits of your Social Security number and tap Next. Then, agree to the Terms and Conditions. It is optional to turn on or off Location Services. Location Services are the GPS features on the iPhone. There are benefits turning on this feature including getting driving directions, cool spots and restaurants nearby, and many more. Make a decision and move on to the next step. On you will be prompted to set up a security passcode or Touch ID. you are allowed to choose either method or use both. This option is available on iPhone 8 series, iPhone 7 series, 6S series, 6 series, and 5S. Touch ID is the fingerprint scanner feature installed on the home button to unlock the iPhone. Another security option is to the Passcode option. This is usually a six-digit password that can be set up to unlock the iPhone. In spite of the outdated use of codes, The passcode is a worthy alternative for Touch ID and Face ID. Make your choices with easy to remember codes, and continue to the next step. Next, There are four options to set up your iPhone. Restore from iCloud Backup: If has an iCloud account and cacked up data. Restore from iTunes Backup: This probably won’t work if you have not used an iPhone in the past. Set Up As New iPhone: This is the right option for new iPhone users. Move Data from Android: You can also move data from an Android OS to iOS. If you choose to restore from iCloud backup, you will be prompted to enter an existing Apple ID or create a new one. Apple Pay is a wireless payment system that uses NFC, Touch ID or Face ID, and your credit or debit card to make Purchase. It is accepted at lots of stores and it is fast and secure. This setup option is unavailable on iPhone 5 or 5C, or earlier because they can’t use Apple Pay. If your bank supports it. Tap Next from the introductory screen. Note that backup was restored from a backup and had Apple Pay setup then skip step 3. 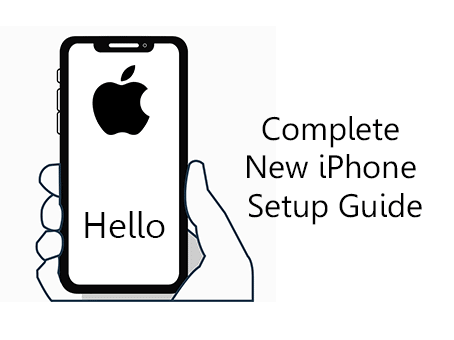 If you set up a new iPhone user from Android, follow the Apple Pay set-up this Step. Filing your three-digit security code on the rare side of your card to verify it and tap Next. Read and Accept Apple Pay terms and conditions. Verify your debit card. The final screen details how that can be done. Then, Tap Next to continue. Proceed by tapping “Use iCloud” then follow the instructions. On iOS 8, a message will display notifying you that Find My iPhone has been enabled by default. For iOS 8 users or higher, tap Next on the Find My iPhone screen and continue. This step only appears if you’re running iOS 8 or higher. On this step, you can opt to use iCloud Drive with your phone. The iCloud Drive allows you to upload files to your iCloud account from one device and sync them automatically to other compatible devices. It is optional you either add iCloud Drive to your device or skip by tapping Not Now. Nevermind if you don’t see the need now, you can still turn it on at a later date. This step is only available to those that have used iCloud Keychain in the past on other devices. Keychain is the password management system by Apple. It iCloud-compatible devices to share login information for accounts, credit card information, and more. It’s a very thoughtful system because it automatically enters passwords on websites, thus making payments become easier. To continue the service, firstly validate that your new iPhone should have access. That can be done by tapping to Approve using Other Device or iCloud Security Code. The first option will prompt you to log into iCloud Keychain, while the latter will send a confirmation message. Grant access and continue. Siri is the iPhone’s voice-activated assistant performs spoken command. Like most steps it is optional. It is one of the most interesting features of the iPhone in recent time because it is smart, fast, and helpful. Start by Tapping Set Up Siri then you will be prompted to speak different phrases to your phone. So as to help, Siri learns your voice as well as your speaking pattern. On completion, tap Continue to finish setting up. The next step, Apple will ask if you are willing to share information about your new iPhone. Basic information to know if the iPhone is working or crashes, etc. no personal information is shared. This helps in assessing the overall experience of using the iPhone but is strictly optional. Because users can choose how their screens will display information. You can choose either Standard or Zoomed screen display. Just Tap the option you prefer and preview. This step only appears on the iPhone 8 series or iPhone 7 series phone because the Home button is no longer a true button. Hence, iPhone 8 series or iPhone 7 series offers what’s called haptic feedback (essentially vibration) when you press the “button” so as to simulate a similar effect of a true button. You can also change the Settings later do that by tapping on Customize Later in Settings. To configure it now, tap Get Started. The next screens will sample three levels of feedback for the Home button. Choose one and tap Next to continue. The activation is completed with this step. It’s time to enjoy your phone! Tap Get Started.